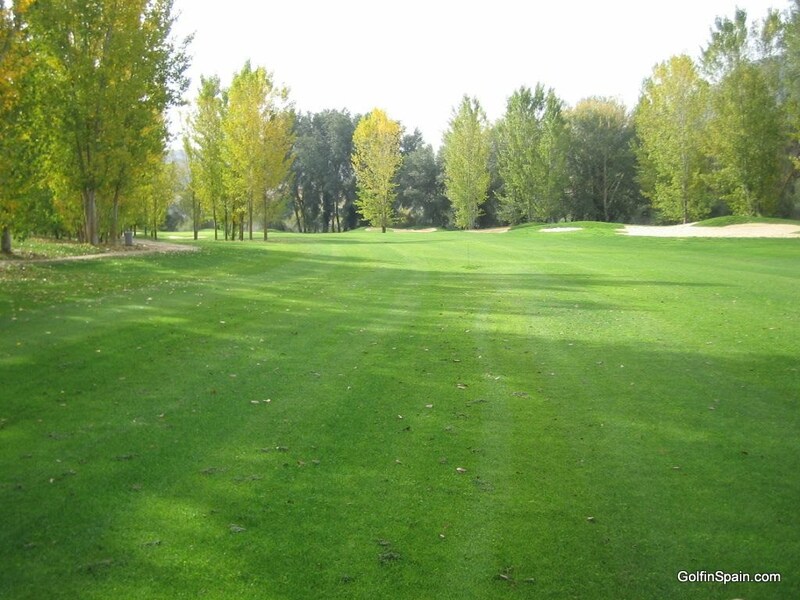 A new 18 hole course constructed in 2007 situated just north of the city of Granada. We played this for the first time in April 2009. The description they provide in one of the golf publications (with a little interpretation from the Spanish) claims: The greens are large, averaging 641m2 with the smallest being 450m2 (if those figures mean anything to you!) with gentle slopes making them difficult to read. The greens are definitely quite large, although we have played on courses with larger greens. Many are clover leaf shaped giving the green keepers the opportunity to place the pins deep into the “leaf” of the three sections on the green making approach shots difficult to get close and you could end up on the green but with no putt directly at the hole. Do not be put off by the temporary club house (it probably has been replaced by now) or the first few holes; the course warrants a much better introduction than that currently experienced and they are working on it. The club house looks as thought the building may be completed in the near future but it is impossible to tell from a distance. Currently there is no bar in the temporary club house and it leaves a lot to be desired. Their green fee offers seem to include a buggy for free and I recommend that you take it; although the course is relatively flat and perfectly reasonable to walk there are several long green to tee paths and one of these is a long steep climb. The second two thirds of the course is much better than the first 5 holes. There are several beautiful holes, some with a vista reminiscent of an English parkland course in places. There are also a few holes with very narrow fairways making them exceptionally tight for anyone other than the straight hitter. 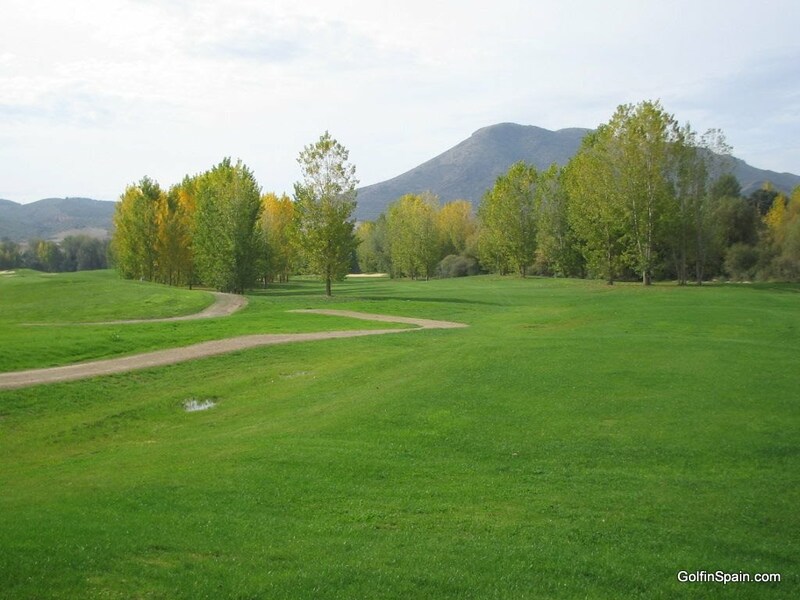 Two of these are around the turn and both holes provide wonderful views from the top of the course of the Sierra Nevada and the hills north of Granada. Water features on 5 of the holes and is sensibly arranged to not significantly penalise the higher handicapper. This course is definitely recommended, especially with green fees of only 30 Euros and a buggy thrown in for free on their special offer. On the day we played (weekday) it was millionaire’s golf, with only one other group on the course far enough ahead of us that most of time you didn’t even see them. It would be advisable to book a tee time, although when we played they told me that we could just turn up on a weekday; the number to call is +34 958 848 502. Their web site is: www.medinaelviragolf.com although as of January 2014 it seems to have disappeared. Although still advertised on many golf websites rumours are that the course has closed. 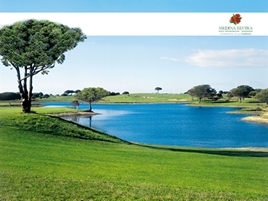 Photos are taken from GolfinSpain.